95% of water on Earth’s surface is salt water - found in our oceans, marshes, brackish-water lakes, inlets, and pools. This resource has been largely untouched by humans but is an incredible resource that we can use for agriculture and consumption if harnessed correctly. The process of desalination, or taking the salt out of salt water, can be expensive and complicated using today’s technology. The majority of people, especially those in areas without readily available access to clean water, don’t have the funds or materials to make use of these expensive processes. However, plants and animals living in salt water and brackish water environments perform filtration techniques each day in order to take the salt out of salt water for their own use and researchers in Singapore are taking notice. At the National University of Singapore’s Environmental Research Institute, researchers have developed a membrane that can filter and purify water at low-pressure levels, thus reducing energy costs by 30%! This is much more sustainable and cost-friendly than current desalination processes like reverse osmosis, which uses tons of power to force water through a membrane, away from salt and other contaminants, and distillation, which involves heating water to the evaporation point and then condensing that water vapor back into liquid water, leaving minerals that were in solution behind. It does this by using aquaporins -- membrane proteins that selectively conduct water molecules in and out of cells, preventing the passage of ions and other solutes like salt. The mangrove plant uses aquaporin to filter out 90-95% of salt from brackish water at its roots, creating fresh water that the plant can use for photosynthesis. 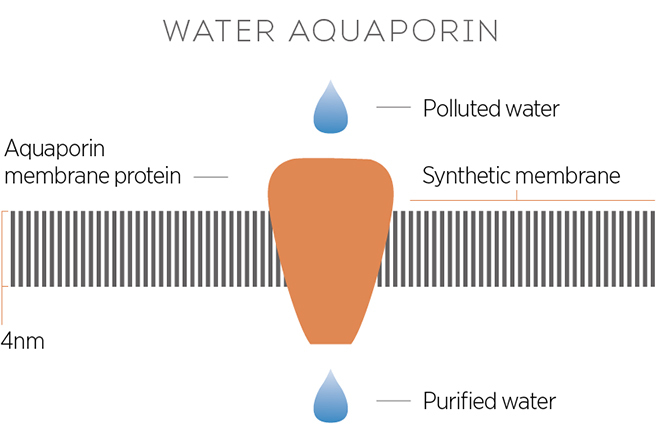 The human kidney also uses aquaporin to aid in the purification of up to 150 liters of water every day - imagine how much water could be filtered using this same technology! Thanks to inspiration from natural water-filtration processes, the world’s largest source of water may be able to be transformed into a source of freshwater for millions of people in need. Wine To Water is so excited by the innovation of these researchers and others like them, who are committed to providing new, more accessible methods of providing clean water.